On Friday, our day of action brought together numerous groups to show solidarity with refugees and to explore the links between the arms trade, migration and institutional racism. In the wake of the current crisis in Calais, we wanted to show its unacceptable that instead of welcoming refugees, our government is welcoming arms dealers – the very people who are fueling and profiting from the crisis. To kick off the day, a petition carrying over 10,000 signatures was delivered to 10 Downing Street with the message “welcome refugees, not arms dealers”. Then, over at the Excel Centre, messages from those who had signed the petition were read out over the mic. The crowd that gathered also heard inspiring talks from a range of speakers including the All African Women’s Group, Green Party Leader Natalie Bennet, a live phone call from migrant groups in Calais, and a rousing speech from Black Dissidents. Inspired by what they heard, activists in the crowd decided it was time to take action. Fittingly, they set up an ‘alternative border force’ with a very simple policy: arms dealers not welcome! The road remained blocked for several hours as the border force did their work of keeping arms dealers from entering the Excel. On Friday, we sent a strong message that this situation is unacceptable. 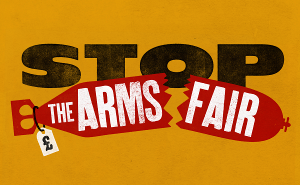 The week of action continues with Saturday’s mass demonstration against the arms fair.